Edwin Lott: Artist, Photographer and Cartoonist. Many of you will be familiar with the name Ernest Carver, the renowned portrait photographer based in Bridgend. Many of you may even have photographs taken by him. What some of you may not know is that before Carver there was another photographer. 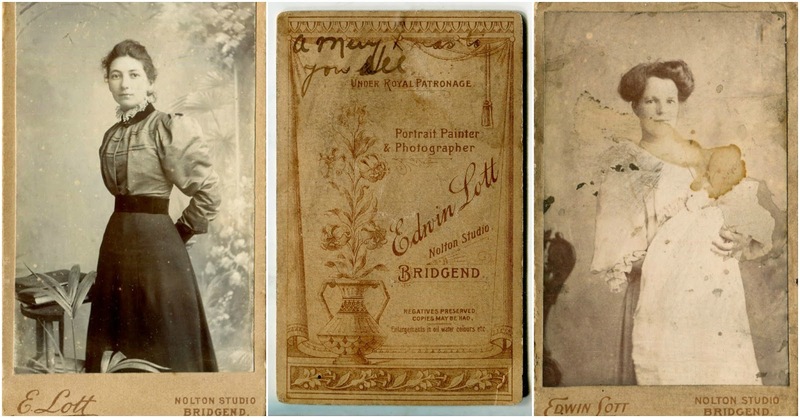 His name was Edwin Lott and is thought to be the first professional photographer established in Bridgend. His studio known as 'Nolton Studio' was established near the Lott family home in 1872. Unfortunately, not much is known about Edwin's life until he established Nolton Studio, even then information is quite sparse. The following information has been drawn together from various certificates, newspaper articles, and various books. Entry of the Baptism of Edwin Lott. Edwin Lott was the youngest son of William and Mary Lott of Nolton Street. 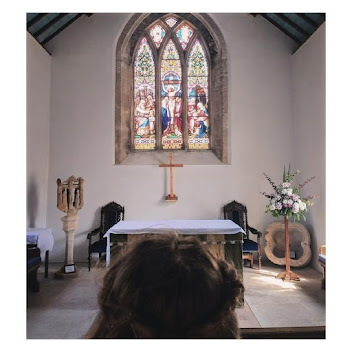 His parents, William Lott and Mary Llewellyn, married at St. Mary's Church, Nolton in 1836. A year before his birth, Mary gave birth to a son named Edwin. Sadly, a month or so later he passed away. A year later, Edwin was born. Edwin, being named after his deceased brother, was baptised at St. Mary's Church, Nolton on the 10th of November 1850. The 1851 census lists Edwin aged 7mths old, living with his family at 6 Nolton Street. Edwin and his brothers seemed to have followed the profession of their father. William was a master painter, glazier, and artist for the Dunraven Estate. The 1861 census shows that Edwin was a scholar. William and Reuben (Edwin's brothers) were painters. The 1871 census shows that Edwin was now a painter. Interestingly, it also shows his brother Reuben was a painter employing four men. The 1881 census shows Edwin, living at the same address and was now a Photographer. The 1891 census shows Edwin as head of the household. There his occupation is listed as an Artist and Photographer. Living with his mother, sister, nephew, niece and servant. The 1901 census shows Edwin, again as head of the household but now living at 9 Nolton Street. There his occupation is listed as an Artist and Photographer. It also mentions that he worked from home and was bilingual. There, he was living with his sister, niece, and servant. The 1911 census shows Edwin as head of the household. There he was living with his nephew, also named Edwin who was his assistant photographer. The census entry shows that Edwin, then aged 61 was suffering from a Rheumatic disease. 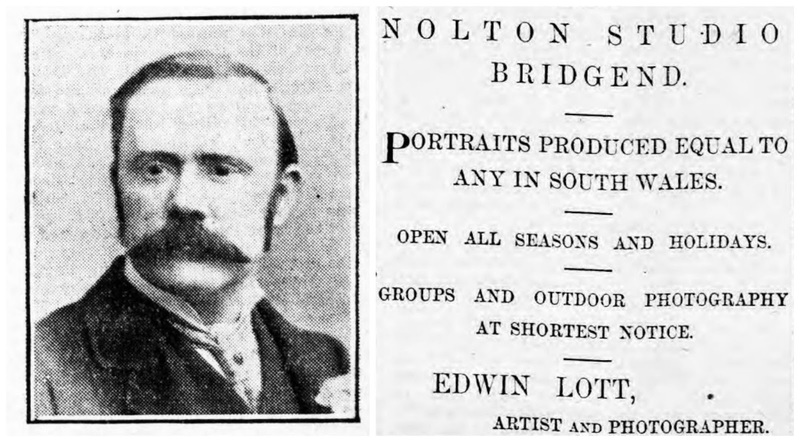 A photograph of Edwin Lott & Advertisement for Nolton Studio, 1891. As well as being a portrait photographer, Edwin Lott was known to photograph Sports Teams, District Officials, and even dogs! One of the highlights of Edwin Lott's photographic career was photographing Princess Mary of Teck and her Royal Party. 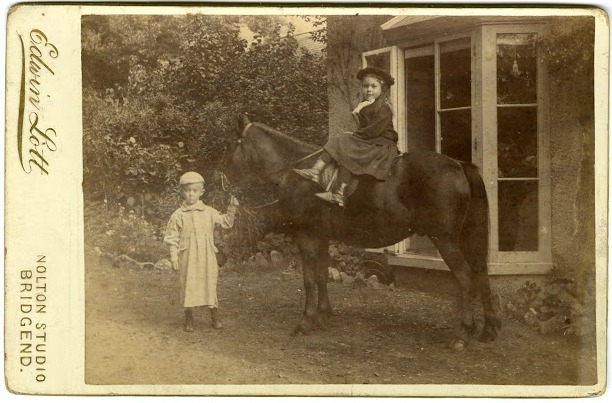 The Princess of Teck paid a visit to the town of Bridgend in 1888, while on her way to Dunraven Castle. After arriving at Bridgend Railway Station, the Royal party made their way down Dunraven Road, then to Wyndham Street, Dunraven Place, Caroline Street and finally Nolton Street. It was there at Nolton Street, Edwin Lott photographed the Royal Party along with Lord Dunraven. An interesting snippet from The Western Mail. Like his father William, Edwin Lott was a very talented Cartoonist. He was known for causing quite a stir among the Local Board of Guardians. His cartoons on the candidates for election to the Local Board of Guardians were exhibited in his shop window, and they attracted much attention from the ratepayers. It is noted that once when there was a dispute as to a right of way, Edwin Lott drew an amusing cartoon representative of the leading figures in the quarrel, and the picture of these men engaged in discoursing music on various instruments appropriate to their previous conduct in the affair created considerable 'mirth'. On the 21st of February 1914, Edwin Lott passed away after a short illness. His funeral was held at St. Mary's Church, Nolton. The service in the church was conducted by the Rev. F. W. Edmondes and Rev. T. P. Price officiated at the graveside. The mourners included Messrs. E. J. Lott, J. L. Stradling, and John Lewis. Among others who attended were the Rev. David Phillips, and Messrs. Edward Preece, Harry Lewis, George Bevan, R. Jenkins, T. Jenkins, D. II. Thomas, W. Evans, W. Williams, Tom Swift, T. Woodward, Lloyd Jones and Bedford Morgan. Llandaff Probate Records show that Edwin Lott left his entire estate to his nephew, Edwin J. Lott, who was also his assistant photographer. After the death of his Uncle, Edwin J. Lott continued the family photography business until his death in 1926. Portraits taken by Edwin Lott.